The current scenario of the online realm stresses the need for almost every brand to have an interactive, user-friendly website. A website provides a platform from which a brand can connect to consumers, display their products and services and keep the online audience informed about the latest happenings at their company. A website is an integral medium to promote your business and reach people across the globe. If your website is difficult to navigate and provides a poor user experience, it can affect your brand negatively. Smartphone users and iPad users are increasing day by day. It is important for a brand to create a responsive or mobile-friendly website. People love to browse the web on their phones when they want to look for products or services they require. If your website does not function properly on mobile phones, it leaves a negative effect on your brand. There is always a requirement for responsive web design so that your website runs properly across all electronic devices. Also, using more mobile friendly plugins provides consumers with an enriching browsing experience and can lead to a greater amount of revenue. When an online user visits your website, they expect the page to load quickly. A page that loads slowly is a cause for frustration, and it might lead visitors to leave your site before they even purchase your product. So, remember to check the speed of the pages on your site and see whether they work on all devices like laptops, mobile phones, and tablets. The site should load fast across all platforms and offer online users a good browsing experience. So, ask your web development company to work on improving load speed rates to lower bounce rates and increase sessions. It is very important for a brand to simplify the navigation process on their website. Visitors often find a website’s navigation process to be very complicated. As a result, they leave the site never to return. So, try to make the navigation process as simple as you can so that users can browse through the website without any hassle. Try to keep your navigation intuitive, make your labels descriptive and try not to have more than seven menu items. It has often been seen that business owners think that too much of white space on a website is a big no-no! They think that a website should be packed with as much information as possible. However, market research has revealed a very different story altogether. White spaces around headings and titles have a positive influence on user attention. It also gives webpage a fresh, open and modern look. So, as a brand owner, it is important for you to understand this and explain this to UI or UX design company you hire to develop your site. The homepage is a summarized version of your entire site. Online users will look at this page when they visit your site for the first time. It is the entryway to your website and most users observe this page to determine whether they would navigate further on your website, or not. Websites with the best UX are easy to follow and simplistic in nature. Their design is not overwhelming and is yet good enough to impress online users at the first chance. The home page should have a design comprising of subheadings, short paragraphs containing sentences, large texts, and bullet points to enhance user engagement as well as conversions. 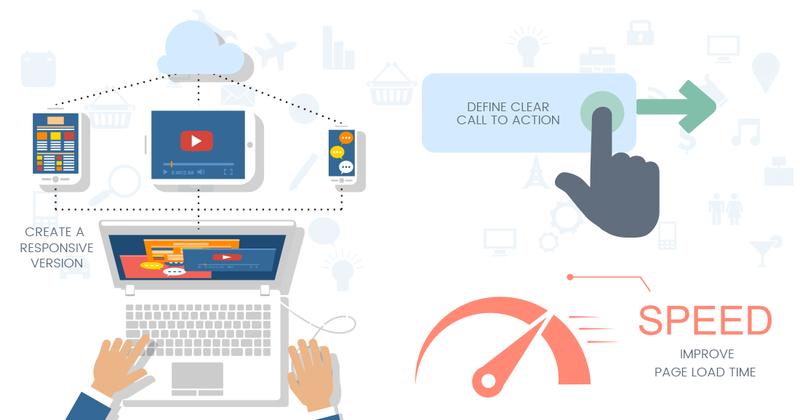 Apart from having a responsive web design version of your website, it is important for you to have the proper call to action that guides user behavior. A call to action button on your homepage is always helpful for increasing conversion rates on your website. Reputed SEO services provider suggest that instead of a text link, a call to action button can increase conversion rates to a considerable extent. If you wish that the call to action you use should be game-changing, then make sure to use words like “discover’, “start” or “learn” in it. Bullet points, headlines and any sort of numbered lists are always helpful in capturing user attention. This is a great way to provide all the information visitors require quickly and efficiently. You can always get creative with bullet points by using icons and images that would stress on the point you are trying to make and to stick to the tone your brand sets. A photo, video, or a GiF is something we all love to see. The use of realistic stock photos is more likely to draw attention to a page. According to research, users spend 10% more time to look at the pictures on the “about us” page rather than reading the page content. So, when you are giving a UX design company the responsibility of developing your website, ask them to incorporate great visuals for better user engagement. Also, custom illustrations are always a great idea to improve user experience and engagement at the same time. When compared to regular stick images, customized illustrations have proved to be helpful in keeping visitors on your site. Responsive web design, fast loading speed, and easy website navigation provide a better browsing experience. Web pages contain headings, subheadings, relevant stock images along with content can help grab user attention. Use more customized illustrations in addition to using the white space on your site wisely, to improve user attention. Clear call to action button, its placement and bullet points also help to grab user attention and improve ROI.